TuneUp Utilities 2011 Review: Can the Giant Keep the Trophy? Can the Giant Keep the Trophy of the Best Windows Optimization Software? Summary: With big improvement over several key features from last version and an introduction of the innovative TuneUp Program Deactivator, TuneUp Utilities 2011 has raised the bar on the competition. By saying that, this is simply still the best Windows optimization software out there. From the sleek design, effective and dynamic system condition analysis, abundance tools and utilities that each is presented with care in detail, to “one-click” optimization mechanism that also open possibilities for advance user to explore, you can see that TuneUp has produced a perfect optimization software for everyone. What We Like: Everything. The presentation, the interface, the number of tools and utilities, method of optimization, and even the price that is very reasonable for software this good. What We don’t Like: Almost nothing except that we expected TuneUp provided a tuned-down version inside the package to be used for slower systems like netbook or other Intel Atom powered systems. But this might seem quite unfair as other products require us to pay more by buying the separated netbook-version. Last week, TuneUp sent me their copy of the new TuneUp Utilities 2011 just before the retail version was released. As a regular user of the program, I was delighted that I had the opportunity to be among the first people who can test the new version. Honestly, there are not many PC optimization programs that can truly offer you a true automatic optimization features. What I have seen this far is a bunch of programs that throw us a compilation of tools and utilities in one package but nothing else. And personally for me, there are only two Windows optimization programs that I constantly keep my eyes on: Iolo System Mechanic and of course TuneUp Utilities. The reason behind this is not because both of the programs have been in the industry for more than 10 years and it’s not also because they have collected so many prestigious awards from dozens of both online and traditional media although this is of course not a bad reason at all. It’s more to the fact that they truly can optimize my Windows significantly. Besides, an award is only a representation of something. And that “something” is really matter if you find it genuine and useful. And talking about usefulness, I found TuneUp Utilities to be more helpful and much easier to use than any other Windows optimization software out there including System Mechanic. That is why it has been a regular program on all my Windows systems. But now, we will find out if the new TuneUp Utilities 2011 can fulfill the big responsibility which has been thrust upon its shoulders? Is This just Another Windows Optimization Software? For you who are not familiar with Windows optimization software, basically it’s a program that optimizes some areas of Windows that overtime may slow down the overall system performance. These areas include Windows registry, hard disk fragmentation, startup entry, and Windows settings. A Traditional Windows optimization software usually offers a combination of tools that enable us to do optimization of these areas. So registry cleaner module, hard disk defragmenting tool, startup entry editor, and Windows setting tweaker have become standard features for them. Actually you can find all of these tools separately for free, some are already installed inside your Windows and some are available over the internet. That is why when I found another Windows optimization program that only offer a combination of these tools, just add it with some other extra features here and there but with no extra value, I keep wondering how on earth they manage to convince their customers about their optimization method? And this is exactly when TuneUp Utilities comes to rescue the name of Windows optimization software. I already stressed the concept of “extra value” that is essential for every tools inside a Windows optimization program. And that is exactly what TuneUp does with their product. They not only throw us with dozens of individual tools that are very similar from hundreds of other same tools, but they also add three important aspects in it: intelligence, independence, and simplicity. For instance, you can see these aspects reflected in their TuneUp Startup Manager: There is more to find other than a list of startup programs that you can disable which is by the way already offered through your Windows System Configuration Utility. Inside, you will find their evaluation and usefulness rating for every program. While evaluation rating is based on TuneUp own database which decides which program is necessary, unnecessary, or optional to be run at startup, the usefulness rating is based on the opinion shared by other TuneUp Utilities users over the same programs. With these two rating systems, even a beginner could decide which program to disable. The ratings itself are maintained and updated independently both offline and online. Furthermore, if TuneUp finds a program unnecessary, it will automatically give the recommendation on the main menu below the “Increase Performance” alert column. Recommendation like this that impact overall system performance will be updated automatically and dynamically every time. This appears not only inside TuneUp menu but also pops out automatically from the notification area of your desktop. So you see that the three concepts are applied nicely here. The three aspects are also apparent as soon as you load TuneUp Utilities and see the main menu for the first time. You will be greeted with a screen that could be described as your system condition summary. There are reports about “Performance” and “Problems” which are updated automatically and dynamically both when the program runs and active in the background. So you will see different result in different time and condition depending on what you have done with your system. If TuneUp find any problems it will show you its recommendation and conduct an immediate action as soon as you approve it. There is also Tuning status that reports the progress of the optimization steps that have been carried out. This is important to remind you which recommendation that hasn’t been taken. So overall, the main menu provides an easy way to optimize your system and bring any potential out of it even when you are only starting the program for the first time. This way, you will not wondering around thinking what you should do next with the program. When you are ready to get a little bit advanced or want to dig deep into every possibility TuneUp may open, you can access the individual tools from other tabs located at the upper side of the menu. There are four other categories that you can choose from: Optimize System, Gain Disk Space, Fix Problems, and Customize Windows. Each consists of its own group of tools to help you achieve the target. For instance, TuneUp Startup Manager that we have been discussed before are laid under the Optimize System category along with TuneUp Registry Cleaner, TuneUp Drive Defrag, TuneUp Turbo Mode, etc. If you access the Gain Disk Space, you will discover the reason why overtime Windows takes more and more space from your disk. TuneUp answer this with its recommendation and ability to delete some unnecessary System files that are impossible to be done naturally with Windows. With this, you can save from hundreds of Megabytes to several Gigabytes of space. You can also easily disable some Windows settings here that consume huge amount of disk space like Hibernation and Windows Search Index. TuneUp Disk Space Explorer is impressive as well. Although this is not a vital optimization tool, surely this adds up the effectiveness of the programs. Basically the feature will index and list all your files in the hard drive(s) from the smallest to the biggest one that take the most space out of your hard disk. You can then view the report in a list or pie chart presentation. 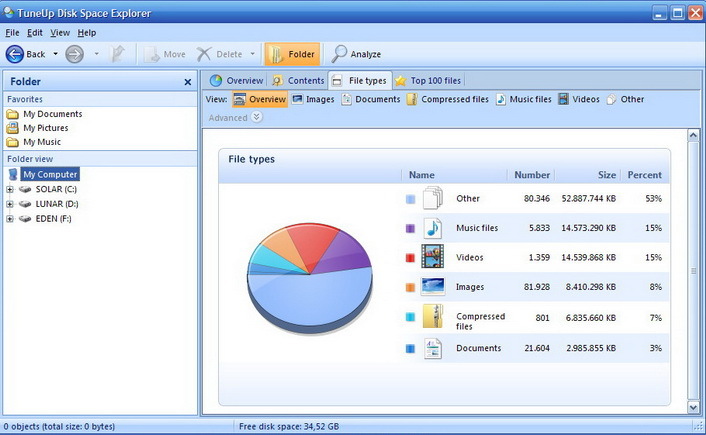 You can also classify it by file types, content, or top 100 files that take the biggest hard disk space. This is a neat feature to know every file that exists in your hard disk and to decide if some of them worth to keep. Even the pie chart successfully made me reconsidered to delete some files that I kept just in case as it pointed me that the files took quite a big part of the pie. Anyway, you can find several optimization programs out there like Ashampoo WinOptimizer that have copied the feature but with less impact. From all the tools inside TuneUp Utilities 2011, maybe the most unrelated tool to the optimization process yet the most surprisingly great is Customize Windows category. Here besides tweaking Windows settings you can also change your boot screen, Windows visual style, or the whole Windows theme as well and pick from your own collection or from dozens of TuneUp own themes library online. Usually to do this you need a stand-alone software like StyleXP or ThemeXP. If you want a straight access to all of TuneUp tools, just click “Overview of all functions” button at the upper right corner of the menu. You will find 30 individual tools are awaiting your order. So overall, although TuneUp has laid everything important at the main menu to ease up your optimization work, accessing each individual tool to find more room either for optimization, gain more disk space, or beautify Windows is very easy. Is There More Special Features? There are two other main features that TuneUp has brought once again after it being first introduced in the last 2010 version: Turbo Mode and Live Optimization. Turbo Mode is a feature that provides us an immediate performance boost by slowing down or disabling entirely the programs or Windows functions that runs in the background and not critically needed at the time. This is very useful if you load a heavy-duty program like high-system-required games, video editor, picture editor, or play high definition video. And according to TuneUp, this version’s Turbo Mode was 10 times more powerful because it can shut down over 70 Windows background process from previously only 7. In realization, this works like a charm on my old Intel Celeron 2GHz laptop with 2GB of DDR I RAM. I played several 720p movies without Turbo Mode and the result as usual is stuttering here and there. When I turn Turbo Mode on, the video played smoothly at a constant speed. I also tried to load some heavy duty programs like GIMP, Roxio Easy Media Creator (to edit video), and XBMC Media Center. The result also showed a significant improvement in performance. But of course, this doesn’t mean that Turbo Mode can make you run a program with system requirement that exceed your own because it won’t do you no good. What it does is providing you with as much available power of your system as it can for one or two specific programs. This condition is of course better than if all the system resource is shared with dozens of Windows functions and programs. Live Optimization, the second big feature that is also brought from the last version is created to help you increase computer’s response rate and program’s start up. It works by learning your activity when using your computer and set a priority on which program needs more resource when loading and which program should have lower priority because it takes too much resource. In my experience, this feature was helpful when I used multiple programs at once while Turbo Mode is handy when I used one single task like playing Crisis or watching 1080p Avatar. One innovative feature that is introduced in TuneUp Utilities 2011 is TuneUp Program Deactivator. I think it is an answer for our frustration whether to uninstall or leave alone a program that we rarely use. Some programs, even though they are not used, take more or less system performance by loading their services, startup entries, background processes, or scheduled tasks. This is a dilemma. 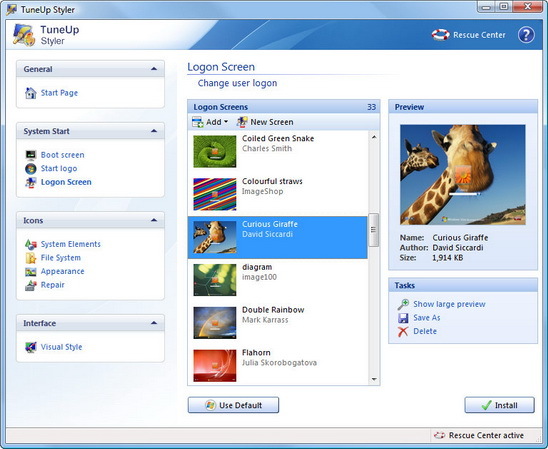 Fortunately with Program Deactivator, you can choose to disable the programs with all of its consumption on the system resource just like it never existed. And unlike uninstalling an entire program, enabling a program only needs a click and a second away. This tool even gives you a report of programs with their own load weight in the system resource. To give you the idea on how this feature works, please take a look at the picture below. I have a Roxio Easy Media Creator that I used for editing video and creating some digital picture creation easily. Even though I rarely use it recently, I still want to keep it in case I have new photos or videos for showcase in special days like New Year. But when I see the report of TuneUp Program Deactivator, sadly this program takes about 20 percent of the total system resource being used. And thus, I have found one of the reasons that make my computer not in full shape. Fortunately, with TuneUp 2011 I don’t need to uninstall this useful program. I just slide the status button to ‘Disabled’ and all of its components that take my system resource will be disabled just like what I want when a program is not used. In practice, my Windows startup and shutdown time has been reduced around that percentage. And this is huge. It means around 15 and 3 seconds respectively. Overall system performance when I doing activities like loading programs and copying or moving data also increases. And the sweet thing about this feature is that, if one day I need Roxio EMC again, I just slide the button to ‘Enabled’ and it is ready to use. Overall, it is a very creative and helpful innovation for actual, real life Windows optimization. Answering the tag line of this title, yes TuneUp has convincingly kept the crown of the best Windows optimization software with this new version. In fact, with the improvement of some elements from previous version and an additional new innovative feature that is very effective in real-life optimization, TuneUp has raised the bar for others to match. Overall, this is a must-have program for Windows users who want to keep their system in top shape without ever needed to reinstall their Windows and all their programs all over again.